Moclamp No.5 Tool Board Set contains 15 pieces with tools which are heated steel. 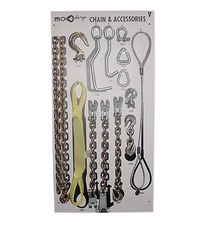 Set includes 3120 small round-nose sheet metal hook, 3140 large round-nose sheet metal hook, 4043 oval loop, 4052 triangle, 4044 1/2 in screw pin shackle, 4145 double grab hook assembly, 4151 grab hook and single claw with 18 in chain. 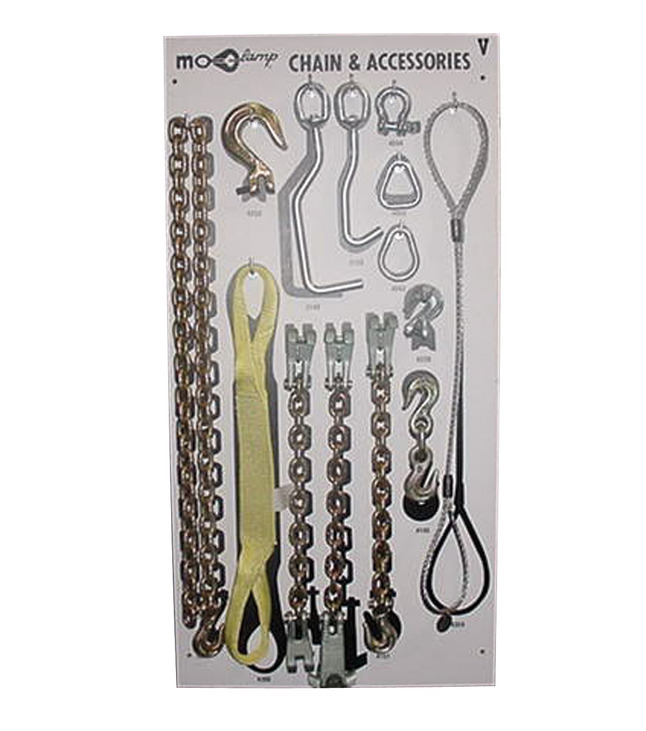 Set also features two 4152 single claw with 18 in chain, 4154 hole plug and single claw with 18 in chain, 6006 3/8 in x 6 ft Mo-clamp chain, 6220 3/8 in super alloy clevis grab hook, 6250 3/8 in alloy clevis slip hook, 6300 nylon sling, 6350 cable sling.